Earlier today I added a second image of Polyhymnia, muse of sacred poetry and hymns, to the 16th century timeline. The new one, shown below on the right, is an anonymous image held in the Louvre, but it is almost an exact mirror image (minus the wings and a few details) of the engraving by Franz Brun shown below on the left. The two pictures make a striking little pair! 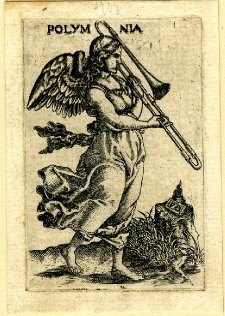 c. 1570—An engraving by Franz Ignaz Brun from the Nine Muses series features an angel-musician playing trombone (see left image; public domain) (British Museum). 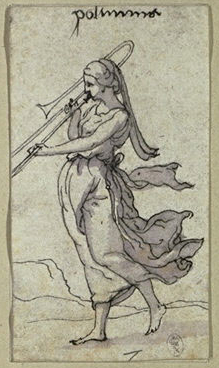 Another image, also representing Polyhymnia, is nearly a mirror image (without the wings), and is probably either a preparatory sketch or a copy of Brun’s (see right image; public domain) (Louvre, INV 18676.6).